If you are looking for a stock that has a solid history of beating earnings estimates and is in a good position to maintain the trend in its next quarterly report, you should consider PPL (PPL). 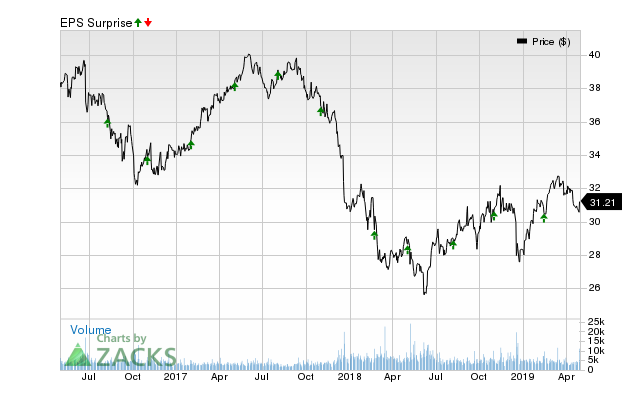 This company, which is in the Zacks Utility – Electric Power industry, shows potential for another earnings beat. This energy and utility holding company has seen a nice streak of beating earnings estimates, especially when looking at the previous two reports. The average surprise for the last two quarters was 6.99%. For the most recent quarter, PPL was expected to post earnings of $0.54 per share, but it reported $0.55 per share instead, representing a surprise of 1.85%. For the previous quarter, the consensus estimate was $0.66 per share, while it actually produced $0.74 per share, a surprise of 12.12%. For PPL, estimates have been trending higher, thanks in part to this earnings surprise history. And when you look at the stock’s positive Zacks Earnings ESP (Expected Surprise Prediction), it’s a great indicator of a future earnings beat, especially when combined with its solid Zacks Rank. PPL has an Earnings ESP of +0.47% at the moment, suggesting that analysts have grown bullish on its near-term earnings potential. When you combine this positive Earnings ESP with the stock’s Zacks Rank #2 (Buy), it shows that another beat is possibly around the corner. The company’s next earnings report is expected to be released on November 1, 2018.